The TC-08 thermocouple data acquisition module is designed to measure a wide range of temperatures using any thermocouple that terminates in a miniature size thermocouple connector. Additionally the TC-08 can also measure other sensors using a ±70 mV range. Featuring built-in cold junction compensation (CJC), the TC-08 has an effective measuring range of -270 to 1820°C (the actual temperature range depends on the thermocouple type being used). The TC-08 can be used with thermocouple types J, K, T, E, R, S, B and N and outputs can be viewed in degrees F, C or mV. The unit is accurate to 0.2 percent ± 0.5 degrees C and has a resolution of better than 0.1 degrees C for most thermocouple types. The TC-08 connects to the USB port of a Windows based PC and enables the host PC to automatically detect the TC-08 avoiding the need for any complex setup procedures. 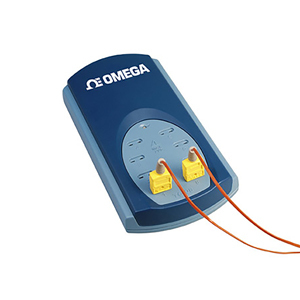 The USB connection also allows the TC-08 to be powered directly by the USB bus eliminating the need for an external power supply and making the TC-08 ideal for measuring temperatures both in the lab and in the field. The TC-08’s USB connectivity allows up to 20 TC-08 USB data acquisition modules to be used simultaneously on one PC making the TC-08 ideal for use as a large multi-channel temperature acquisition system with a cost per channel significantly lower than other systems of this size. The low conversion time of the TC-08 means up to 10 temperature measurements can be taken every second, while the high (20 bit) resolution ensures that the TC-08 can detect minute changes in temperature. With the TC-08 thermocouple data acquisition module your measurements can be made both fast and accurately. Simply plug the TC-08 into a USB port on your computer, connect your thermocouples, and you are ready to measure temperatures. With the included TC-08 Recorder software, you can configure multiple (USB) TC-08s, set the sampling interval from 0.1 seconds to several hours and set the maximum number of readings. You can also tell TC-08 Recorder what to do once the thermocouple readings have been taken - either: Stop; Repeat Immediately (start again); Scroll (oldest recordings disappear); or Repeat After Delay (where the delay is set by the user). Mathematical operations can also be performed on the thermocouple outputs: for example to output one temperature relative to another. Ports: USB 1.1 or USB 2.0 compliant port. 참고: Includes Windows software, USB cable and complete operator’s manual on CD.